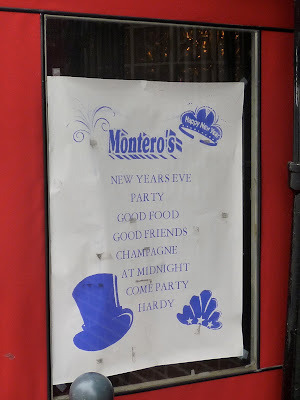 Ring in the New Year at classic, hole-in-the-wall, waterfront, Brooklyn dive Montero! Hey, why not? It's gotta be the only night of the year they pour Champagne there. Korbel, anyone? 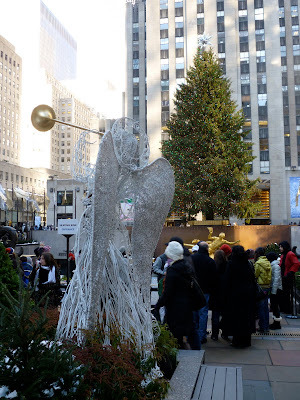 Happy New Year, New York! OK, so Gino's isn't closing on Dec. 31, as previously reported. On Dec. 26, I picked up a report from Eater, which picked it up from the NY Post, that the age-old, red sauce joint on Lexington—which has been suffering from union and recession woes—would shutter on New Year's Eve. So I called to make a reservation for tomorrow. Only the lady who answered said they weren't closing tomorrow, Dec. 31. Just closing early. Then they would be open again on Jan. 1. Huh? But the Post reported they would fold on Dec. 31. No, said the lady: Jan. 31. So I hung up and checked the Post article. Indeed it said Jan. 31. But I remember looking at that article, and it said Dec. 31. And Eater's pick-up article still says Dec. 31. Did the Post make an error? Did they correct it online without making a note of it at the bottom of the article? Anyway, I'm glad Gino's is still open for another month. Norval C. White, a co-author of the "authoritative, encyclopedic, opinionated and constantly consulted" AIA Guide to New York City, died Dec. 26, at 83. He passed far away from the city whose buildings he so wonderfully catalogued, at his home in the village of Roques, in southwest France. I can't even say how many times I have consulted the AIA guide before making a post about the history of an old New York building. It was a priceless source in discovering the date, architect, architectural style of any significant structure in the City, with a little saucy opinion thrown in for good measure. The guide was first published in 1968, just as the preservation movement was getting its footing in New York. White was actually a leader of the fight to save the original Penn Station a few years earlier. 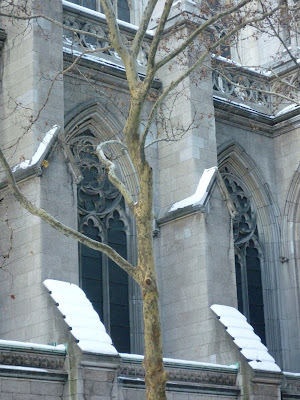 When he heard the beautiful edifice was to be torn down, White and several other architects founded AGBANY (Action Group for Better Architecture in New York). They picketed the station and handed out fliers in protest. As the Times obituary writes, "the AIA Guide tapped into and fostered a growing national awareness that America had an architectural past worth preserving, a present worth studying and a future worth debating. It also offered a template for other city guides. But after four decades, it stands alone." The book began as as a guide he prepared for the American Institute of Architects’ national convention in New York in 1967. It can out as a book the next year. For a time in the 1990s, the book was, insanely, out of print, much to the consternation of historians and New York lovers. The fifth edition is to be published in June by Oxford University Press. 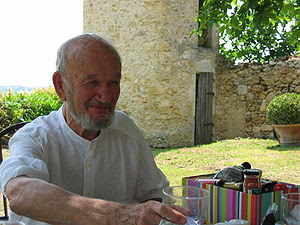 Elliot Willensky, the the other original co-author, died in 1990. Mr. White’s co-author on the new edition is Fran Leadon, an assistant professor of architecture at City College. The man did right by his native City. If more followed his example, we'd be in a better place. 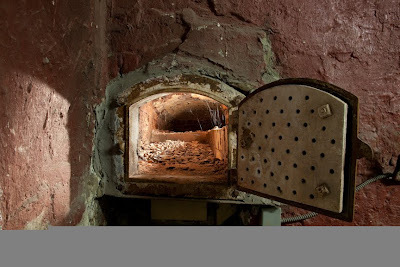 City Bakery's Maury Rubin e-mailed me today, asking if Vesuvio Bakery—the landmark, Irish-green storefront in SoHo that he recently brought back to life as Birdbath Neighborhood Green Bakery—might be taken off my home page tally of "Recently Lost Landmarks." Though the true Vesuvio is indeed lost forever, he has a point that the space is now back in operation, and in its original capacity as a bakery, so I agree to amend the listing. 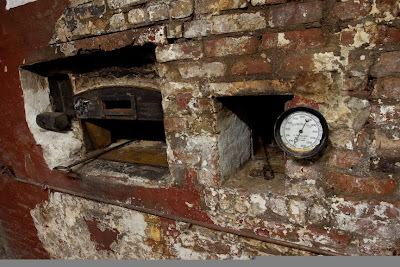 He also sent me some super-cool photos of the coal-fired ovens built into the earth underneath 160 Prince Street. (The photos were taken by Chris Callis.) Looks like an archeological dig you might find in some ancient town in southern Italy. 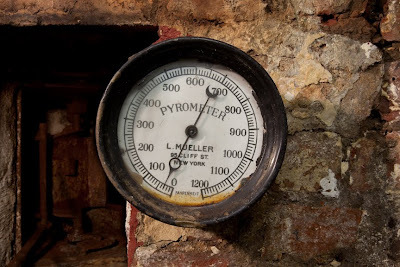 Love the fine pyrometer by L. Mueller of tiny Cliff Street (one block long) in downtown Manhattan. Say goodbye to this familiar yellow door. 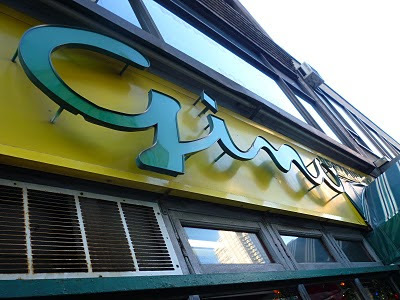 Eater reports that the New York Post reports that the 64 year-old Upper East Side restaurant Gino's will close on Dec. 31. The word came from a union rep. The restaurant has been grappling with its union over a new contract for some time. 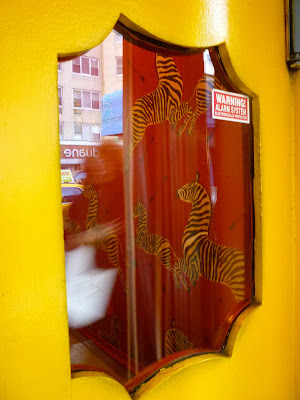 Reports surfaced this month that the troubled Gino would be saved as a white-knight buyer rode in to scoop up the joint, famous for its zebra wallpaper and old-school dishes like veal parmigiana and chicken cacciatore. 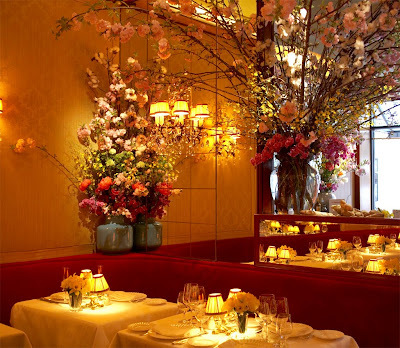 But Dell'Aguzzo told The Post this week a buyer has not materialized and that the Lexington Avenue eatery will not survive. Co-owner Salvatore Doria told The Post he couldn't talk about details of the restaurant's problems. "In a few weeks, we'll know exactly what's the story," he said. "The place is known worldwide. It's a piece of Manhattan. The problem is the economy." 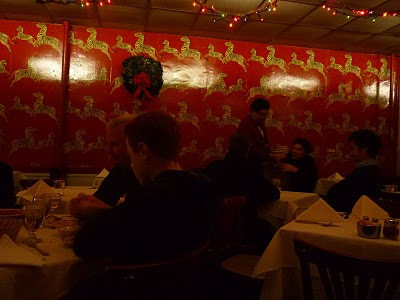 Dell'Aguzzo believes the owners of Gino floated the notion of a buyer so workers would stay on for one last Christmas season before the inevitable closing. The union and management have been fighting since October, when the workers' contract expired and they balked at a request to pay half their health insurance and pension in a new pact. Dell'Aguzzo said he was told that because of the economy, the owners wanted to sell but couldn't because of the labor contract. News that the restaurant is on its deathbed left longtime patrons distraught. "There's a general sadness and disbelief; it's a great tragedy," said Allen Falcona, 77, a patron since 1957. "It will have a huge effect upon a lot of customers, who come daily and sometimes twice a day." I'm glad I took the time to have lunch there last week. Perhaps I will return before Thursday. I can't say. This is hard to take, and hard to believe. Is there any business in New York that New Yorkers truly care enough about to fight for? Or are we all just too defeated at this point. Sometimes it takes an eagle eye to spot the New York history that's been covered up, built over, repainted and obscured. I've passed by the tiny pet shop Let's Pet on Henry Street and Baltic many a time. And, despite appreciating the quasi-European, atmospheric smallness of the Brooklyn storefront, and its neighboring Chinese takeout joint, I didn't notice anything significant about the place. But a few weeks back, the setting sun hit the old wooden door at just the right angle, and I thought I saw something, near the base of the door. 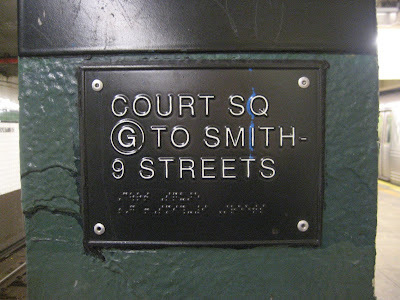 Some letters, almost completely hidden by several coats of paint. "Root" preceded by few more letters, including an "L" and "D."
The owner noticed I was staring at the door. 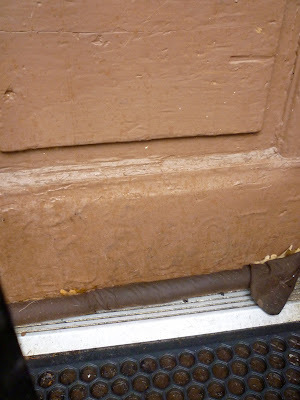 "There's some words at the bottom of your door," I explained. "Wildroot!" she said. "It's a sign for Wildroot. This used to be a barbershop. You're the first person ever to notice that." 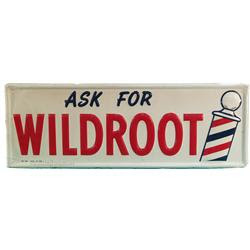 Wildroot was a popular hair tonic in the early and mid-20th century. It was introduced in Buffalo, New York in 1911 with the trademark "Wildroot" registered in 1932. The company was locally owned and operated until 1959 when it purchased by the Colgate-Palmolive Co. The 1937 Wildroot office building and factory still stand at 1740 Bailey Avenue between Broadway and Sycamore Streets. 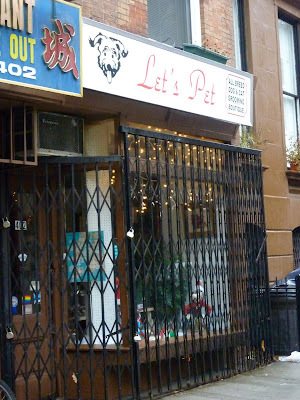 The barbershop must have been there some time ago, because Let's Pet is about 20 years old. Then I pointed out something the owner hadn't notice. 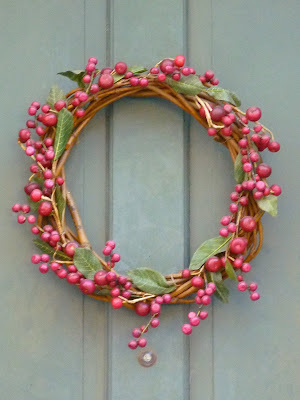 Just above the "Wildroot," in small letters, were the words "Ask for." "Ask for Wildroot." Very likely the sign was a version of the placard seen below. 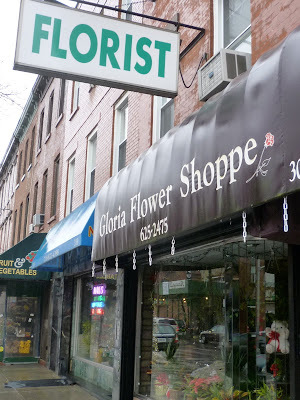 Somewhat recently, I learned that the rather nondescript-looking Gloria Florist on Court Street in Carroll Gardens had a long history in the neighborhood. Before plying blossoms on Court, it used to have a storefront on the other side of the BQE, around Columbia Street. It moved to Court some time in the 1950s. So I went to look at the shop to see if I could spot any evidence of its oldness. Inside, it looked like any florist; nothing antique about it. But then I glanced down as I left. The small step leading up to the entrance contains a beautiful, marble mosaic feature the store's name against the image of a rising sun. It's easy to miss. Check it out next time you visit. 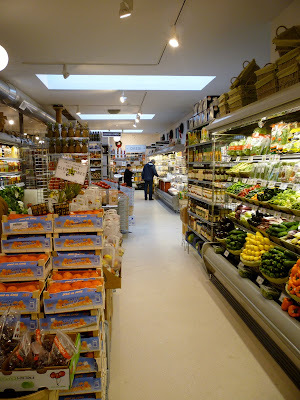 The new Union Market on Court Street in Cobble Hill opened up a couple days before Christmas. Awfully new-looking and clean inside. Notable cheese, produce and meat departments. Yet more food choices in an area that, two years ago, had very few. 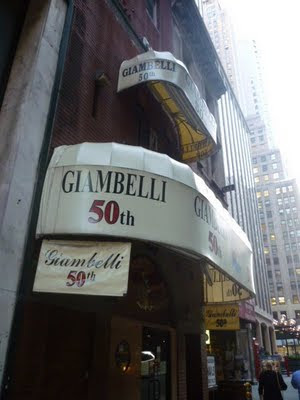 My mom took me to Giambelli's when I turned 16. Mr. Giambelli came by our table and told me he would buy me a glass of champagne when I turned 21. I was visiting from South Florida and I just assumed every New York restaurant was like that -- authentic, family oriented, where the owner came by and appreciated that you chose their place for a special event -- but I've never found something like it in the city ever since. About 9 years later when I was ready to marry the girl of my dreams I took her to Giambelli's and we got engaged. Mr. Giambelli congratulated us and bought us a bottle of champagne. With the closing of the restaurant something has been lost -- I will miss this place and what it represented for me. After leaving Bullet Space, we ducked into Ray’s Candy Store to get out of the gale-force snowstorm and warm up our nearly frostbitten feet. Sadly, we learned that Ray’s business is really down — Belgian fries are at just one-tenth of their usual sales — and that he’s struggling to pay his $4,000 rent this month. It’s the recession, people are just spending less, he said. Actually, he said, this is the first time since he bought the hole-in-the-wall store in 1974 that he’s never paid his rent on the first of the month. “They might throw me out,” he said matter of factly. “If I work alone — no girls, no help — I will make $100 a day and pay my rent. ... And if lose my store, I lose my apartment, too. This is my only income, and it’s too cold to collect cans.” He wasn’t kidding. “I was going to collect cans — the Chinese guy teach me how to do it,” he continued. “You need a shopping cart. The guy taught me how to make a deal with the supers or in the bars — get all the beer cans.” Ray said once in the past he took a loan from the Mafia — with interest of course, and the threat of broken kneecaps; he couldn’t pay back the cash, but luckily a Turkish friend who sold him his chocolate syrup bailed him out. He doesn’t want to go through that again. But he brightened up when some of his favorite friends dropped by in the storm. Emily, the N.Y.U. student who formerly helped him, came by his window to say hi and Ray excitedly rushed over. “I love Emily,” Ray said. “I couldn’t afford her. Fifty dollars is a lot for me. If it was summer [when business is better]... .” And Ilya, the young computer guru who springs for the strippers who dance on Ray’s counter top on his birthdays, somehow biked up through the blinding snow from the Bowery, and got a free fries from Ray. Ray turns 77 on Jan. 25 — so get those tassels twirling. 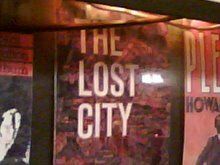 A Very Merry Christmas, and a Happy New Year from the folks (me, basically) at Lost City. Maybe it's my innately perverse outlook, but somehow the recession has made Christmas more precious and resonant this year than in years past. Cartier's, on Fifth Avenue, all wrapped up nice. Don't see that as often as one might like to. 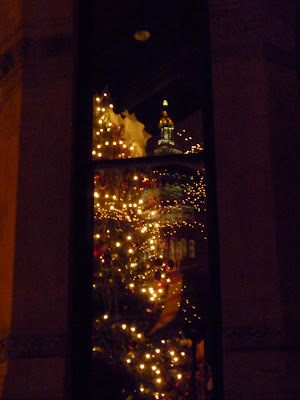 Window of the National Arts Club on Gramercy Park, with tree inside, and skyline reflection outside. I had lunch at Gino's restaurant today. Figured I oughta while I have the chance, because who knowsif it will be around after New Year's. Attendance was sparse. A few full tables. A lady in an enormous, donut-shaped fur hat that everyone kept complimenting out of politeness. Two tables talked about how they used to go to Gino's all the time. At the bar, old men, evidently well familiar with each other, drank wine and talk volubly in Italian, occasionally breaking in Italian song. Seemed like a small family reunion. The maitre d' perched halfway on a stool gazing affectionately/dolefully out at the diners. I asked my waiter if the white knight talked about in the press had decided to buy and save the place yet. "We don't know," he said. "The knight, his carriage, it is stuck." The hat check woman said roughly the same thing: no news. Hm. 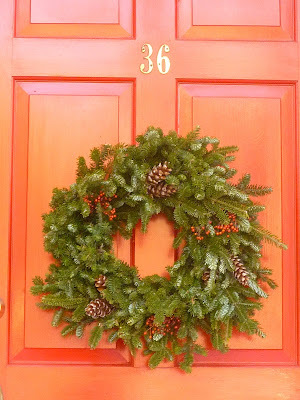 In the Times article, it said owner Michael Miele would know "everything" by Dec. 18. Jesus. Wait to the last minute, why not? FYI, my veal cutlet parmigiana was very good. Dennet Place ain't long. 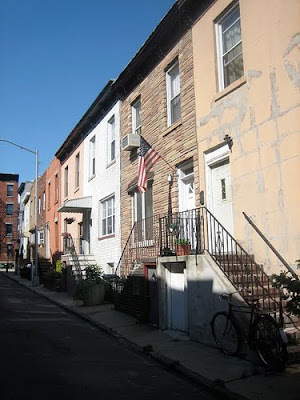 The short Carroll Gardens thoroughfare, between Nelson and Luqueer Streets, hiding behind the hulking mass of St. Mary Star of the Sea, can be traversed in about 30 seconds. But the lane wasn't short on trouble, once upon a time. 1 Dennet Place: Sarah Alcock, an "old rounder," was sent up for 90 days in July 1885. 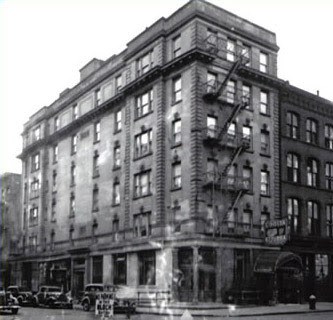 2 Dennet Place: Maggie Davis was arrested April 1890 for robbing a man of $42. 6 Dennet Place: Thomas Owens, arrested April 1885, for abandonment. 7 Dennet Place: Lizzie Mack had 14-year-old brother Johnnie arrested July 1891 for stealing her watch. 8 Dennet Place: Mary Allen, burnt by exploding kerosene lamp, Dec. 1893. Later home to Giulo Rivola, who attempted to dynamite Barrett Manufacturuing company on Smith in March 1906. 9 Dennet Place: James Reardon arrested in 1902 for falsely collecting insurance payments. 16 Dennet Place: Catharine Keeney had her husband Charles T. Foley arrested for bigamy in August 1896. 18 Dennet Place: Bernard Lafferty arrested June 1889 for stabbing a man several times with a pen knife. 20 Dennet Place: Andrew Schell, arrested for assaulting an officer, Oct. 1884. 21 Dennet Place: George Phoebus, arrested Dec. 1890 for misappopriation of funds, having sold a house for Annie Ross at 21 Dennett, and never paying over the money. Phoebus was son of a clergyman, became a lawyer, then a journalist, married an actress in summer 1884, disappeared Christmas day 1885, leaving to Liverpool. Watch yourself when walking down this street. 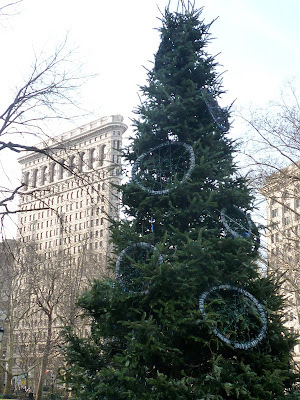 The tree in Madison Square Park. 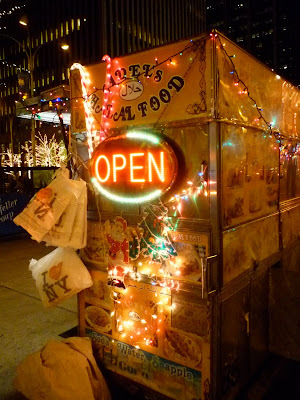 A street vendor on Sixth Avenue in Midtown. Not sure what's going in the Court Street, but something is. Please, not a nail salon. The Grotta Azzurra is not exactly lost. 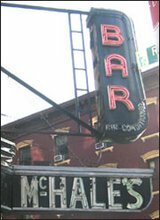 It still sits on the corner of Mulberry and Broome, where it was founded by the DaVino family in 1908. However, it shuttered for six years recently, and, when it reopened, it was no longer run by the DaVinos and is reportedly not the same. So it's a long shot that you're ever find this recipe. It's from a humble, ring-binder, cookbook self-published by John Davino in 1977. According to the introduction, all the recipes within come not only from the restaurant, but "have been handed down form father to son since the 1800's, and each dish has remained untouched from the original recipe." The book was kindly given to me by the owner of Bopkat, the great antique shop on Union Street near Columbia in Brooklyn. She thought I would appreciate it. She was right. Combine beef, pork, bread, eggs, cheese, parsley, basil, salt, pepper and garlic. Mix well. Shape mixture into 2 1/2 inch balls. Place into baking pan with oil. Bake about 1 1/2 hours at 350 degrees. I found the large size of the meatballs made a big difference. They were crispy on the outside, moist on the inside. Previous "Recipes of the Lost City"
I was at the Court Square stop on the G line. People who take the G train regularly know how this works. 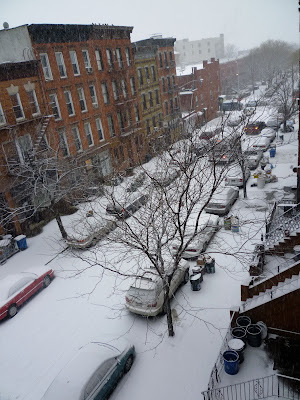 A Brooklyn-bound train pulls into the station and a single half-door per car slides open to let people in. All the doors don't open until the train is ready to leave the station. I had finished my business in Queens and, having disembarked the 7 train, was ready to make the transfer. The train came in, the half-doors opened. I looked for my narrow passage into the second car. I found it, but it was blocked. Just inside the door, rooted like oak trees, were two obese female MTA employees, facing each other. Now, I am not trying to gross you out here; I'm just telling you what they were doing. One, her hands firmly on the chin of the other, was assisting her colleague in popping a zit. Seriously. I will give you a moment to retch before you return to this story. Ready? OK. Now, I was standing there. And I am a tall man. Easy to see. But they moved not. Nor did they acknowledge my presence or the fact that they were absolutely blocking the only point of entrance into the car. They just continued talking and performing their minor surgical operation. I had had a long day. I was tired. I wanted to sit down. "Excuse me," I said, and—I'll admit!—with some garden variety New Yorker brusqueness, more or less sidled inside the car. The MTA ladies were indignant. I was simply the rudest human being they had ever met. "I'm sorry, can we please exit," said one with a great deal of tartness. She had shown no signs of planning to exit. "The word is 'Excuse me'!" And they left in a huff. Actually, "Excuse me" is two words. Actually, I said "Excuse me." Actually you are MTA employees and you were blocking the damn door to the subway car, so maybe you should say "Excuse me." The crèche and holiday display outside the Brooklyn Container Port in Red Hook. Non-Religious, Non-Holiday-Specific, Lighted Greeting in Ever-All-Welcoming Greenwich Village. Every since I discovered that the Eileen Dugan Senior Center at 380 Court Street, on the west side of Carroll Park in Brooklyn, used to be a Norwegian Salvation Army—or "Frelsesarmeen," as is carved at the top of the facade—I've been intrigued by the hulking, cream-colored building. I knew that no aspect of the interior any longer betrayed the original function of the structure. 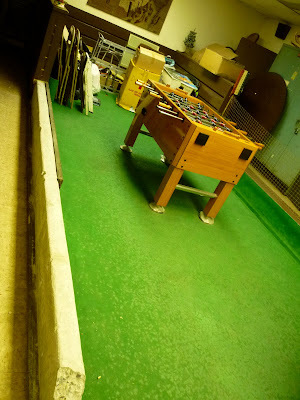 But I had read that, in the basement of the Senior Center, which was founded in 1974, there was a full-fledged boccie court, there to amuse the center's many old Italian-American residents. Was it still there? Recently, I worked up the courage to go in and investigate. A staff member told me that, yes, the court was still there, but—alas!—it was about to be torn down. By some chance, the director was on hand. I asked if I might see the court before it was removed. An amiable man, he agreed. 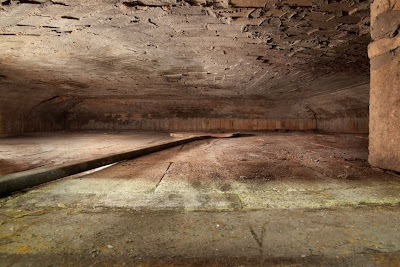 In articles printed in 1974, it was described as 30 by 8 feet and covered with pale yellow clay. A layer of green felt has been applied to the clay since then. 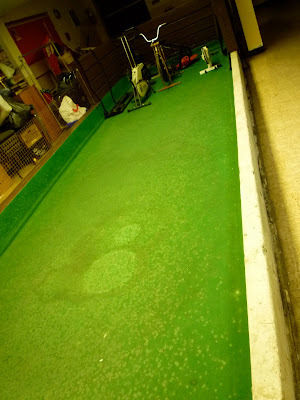 The manager said the court wasn't used anymore because there weren't any more old Italians to play Boccie Ball. They all died off. He hopes to use the space in a way that's more appealing to greater numbers. I understand. But it's a shame. I'll wager that this may be the only senior center in the country to be so equipped. Lost City Asks "Who Goes to Rolf's"? Egad! New Owner for Gino's?! Lost City Asks "Who Goes to Armondo's?"